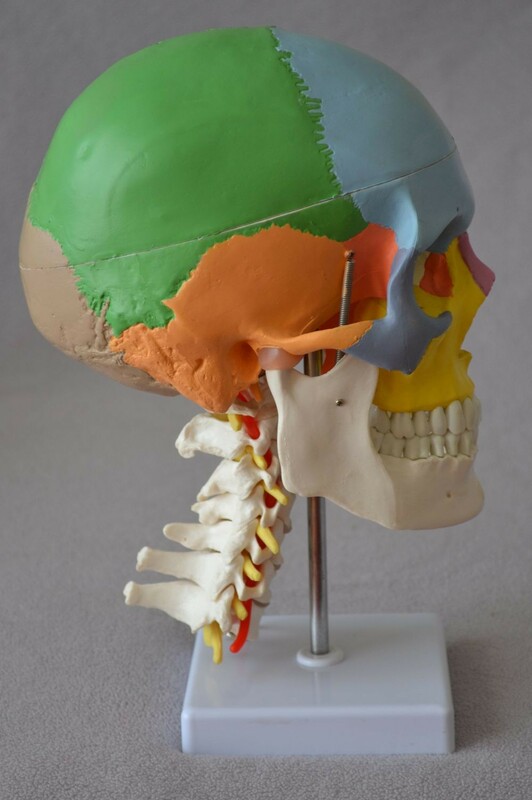 This Life-size skull model with cervical spine column is high quality original cast. It is flexibly mounted on a stand, with 7 cervical vertebrae. It is highly accurate representation of the fissures, foramina, processes, sutures, parietal, hindbrain, spinal cord, cervical nerves, vertebral arteries, basilar artery and rear cerebral arteries. The teeth are separated, same as real one, in ceramic white color. The model uses different colors to show the shapes and relationships of the various bone plates of the skull. It is the perfect tool for professional teaching and study of human anatomy. Skull is 3-part: Calvaria, Base of Skull, and Mandible. Mandible of skull is mounted on a spring to easily demonstrate natural movement.